The properties of anisotropic single-mode fiber lightguides with an elliptical highly doped germanium core and elliptical fluorine-doped cladding have been investigated. When the difference of the refractive indices of the core and the cladding equals 0.033 and the ratio of the axes of the core is about 2, the birefringence is about 0.00037. 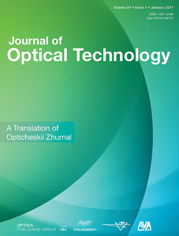 The fabricated lightguides, despite the differential optical losses of the orthogonal modes to radiation leakage, are distinguished by a low level of polarization stability. The degree to which the radiation remains polarized in them (≈0.003 m<sup>−1</sup>) is two orders of magnitude worse than in commercially produced lightguides. This is probably caused by local microstrain of the low-viscosity glass of the core.